4/09/19 – CIPHER releases! Available exclusively at Amazon for a limited time, but I’ll announce when it’s available at all retailers. 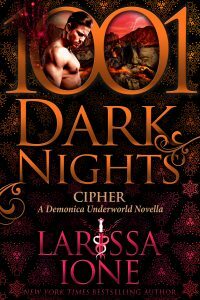 It will be available well before REAPER releases, so there will be plenty of time to catch up before the big finale of the Demonica Underworld series! 11/06/18 – Dining With Angels releases! Available from all retailers. For more information, click here. 07/01/18: HAWKYN is now available at all retailers! Click here for links! 04/10/18: Her Guardian Angel releases! Click here for more information! 02/27/18: Ready to dive back into the Demonica world? Then you’re in luck, because HAWKYN just released! Exclusive to Amazon for a limited time, and I’ll be sure to announce when it’s available everywhere! 11/28/17: Vampire Fight Club releases! Originally part of the Supernatural anthology, it is now available as an individual Demonica novella! 9/25/2017: Forsaken By Night, the third story in the MoonBound Clan Vampires series releases! Originally part of the Blood Red Kiss anthology, it is now available as an individual novella! 9/24/2017: Larissa’s new site is now live!!!! All site content is copyright © Larissa Ione and any reproduction of any kind is prohibited.